Are you better at building...or explaining how to do it? What if you have to build with your eyes closed, or using only one hand? Or if you must explain it without speaking? Can you still be faster than your opponents? 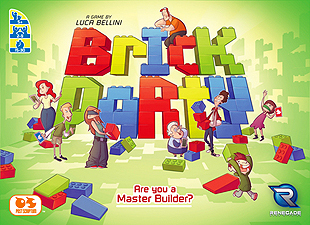 BRICK PARTY is the funny and frenzied game of crazy buildings! Reveal the special rule for the round, choose your teammate, and get ready. Then grab the blocks and build the shape you choose faster than the others! And in the next round? A new special rule, new partners, and new shapes...for a game that's never boring!